The use of DNA tests for identification has revolutionized court proceedings in criminal and paternity cases. Now, requests by litigants to admit or compel a second generation of genetic tests – tests to confirm or predict genetic diseases and conditions – threaten to affect judicial decision-making in many more contexts. Unlike DNA tests for identification, these second generation tests may provide highly personal health and behavioral information about individuals and their relatives and will pose new challenges for trial court judges. 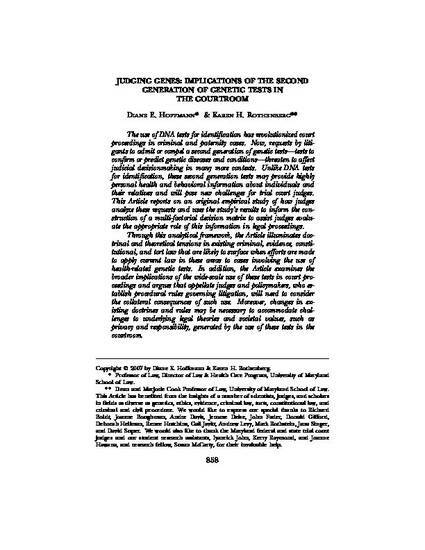 This article reports on an original empirical study of how judges analyze these requests and uses the study results to inform the construction of a multi-factorial decision matrix to assist judges evaluate the appropriate role of this information in legal proceedings. Through this analytical framework, the article illuminates doctrinal and theoretical tensions in existing criminal, evidence, constitutional and tort law that are likely to surface when efforts are made to apply current law in these areas to cases involving the use of health-related genetic tests. In addition, the article examines the broader implications of the wide scale use of these tests in court proceedings and argues that appellate judges and policymakers, who establish procedural rules governing litigation, will need to consider the collateral consequences of such wide scale use. Changes in some existing doctrines and/or rules may be necessary to accommodate challenges to underlying legal theories presented by these genetic tests and to preserve values such as privacy and family relationships threatened by the use of these tests in the courtroom. 66 Maryland Law Review 858 (2007).